ACJ Group has an in-house architectural services team, fully qualified to design every aspect of your new build property, extension or renovation. Working closely with the other services within the ACJ group, ACJ Design is uniquely placed to select the right materials and construction methods that will ensure your home build is flawless. Whether you’re an individual, a homebuilder group or an architect, ACJ Design can work with you to develop your vision. When you work with ACJ Design, our architectural technicians design and plan every aspect of your build. We precision model each project on the latest 3D computer systems, eliminating waste and errors upfront, enhancing efficient production and construction, and allowing you to see an accurate view of your project, so you can make informed decisions about your build, with no surprises. 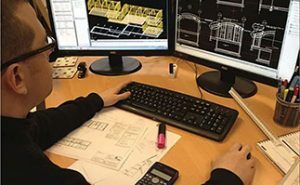 When one team of professionals takes responsibility for all aspects of your design, from the planning to production to construction, you can be confident of a set of consistent coherent plans throughout the process. Having a single source of plans, rather than working with an independent architect, cuts out delays in planning and warrant applications and saves you time and money. All ACJ homes are designed with energy-efficiency built in, so heating your home is cost effective and hassle free. Our design team are uniquely placed to advise you on the ACJ wall system to suit your needs and budget, we carry out energy performance calculations based on your selected materials and advise you where and how to make savings. We are justifiably proud that ACJ Design team developed the industry leading Therm-U-Wall system, a breakthrough in energy-efficient wall systems, suitable for use in the demanding specifications of passive house builds. ACJ Design designers have been behind some of the most prestigious PassivHaus developments over the last ten years. – The first fully certified PassivHaus in Scotland. – The first fully certified Affordable housing PassivHaus in Scotland. – The first fully certified terrace of passive houses in Scotland. Click here to see our range of wall systems, any of which can be customised to your own requirements. Working with ACJ Group company, Cormack Homes, we can advise on appropriate renewable technologies, and perform detailed energy calculations based on the decisions you’ve made. And we’ll ensure all of this is done on time and within your budget.